vary with each state, at some of these wildlife resources you can camp either free or very cheap. Some refuges can be quite scenic, on ponds maintained for ducks for instance. 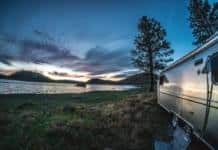 In some states (California is one example) you can camp free if you have a state fishing or hunting license. If not, you can still camp but will have to pay, usually a very reasonable fee. Check online or at regional Fish & Game offices for policies and locations — but avoid during hunting seasons.